The long-awaited license plate for our Arctic Fox finally arrived. By 10 am the following morning, after we had packed, cleaned, hitched, measured our height, loaded the bikes, and taken pics of our new set-up, we hit the open road. For this, our maiden voyage, we loaded very thoughtfully and carefully. While getting the current Reese hitch checked, we had discovered the truck had suspension airbags so we spent time measuring the height with the truck unloaded and then loaded and adjusted accordingly with air; Mike had done a pre-flight check the day before, torquing all the nuts and bolts on the trailer hitch and wheels as well as the truck wheels….we felt confident and safe. We were ready. The truck performed flawlessly – so happy with it – it just chugged up the hills. Absolutely marvelous. The trailer too….followed the truck like rats following the Pied Piper!!! We had invested in a new GPS, Rand McNally, because I was terrified that the tunnels on the 101 would tear away something atop the the trailer or even take off the whole roof!!! This GPS is meant for RV’s. You can enter your height and length and it will route you the best way…..and it did…..all too well! Leaving Pasco, WA, we followed I 84 to Portland – heavy traffic (after all, we were traveling on Good Friday) but all went perfectly. From Portland we followed US 26 NE to NW Timber Road. It routed us that way because there was a tunnel further along on the 26 with an unspecified height…I didn’t want to chance it. Mike’s thinking was that if it’s on a major highway, then we shouldn’t have any problems. 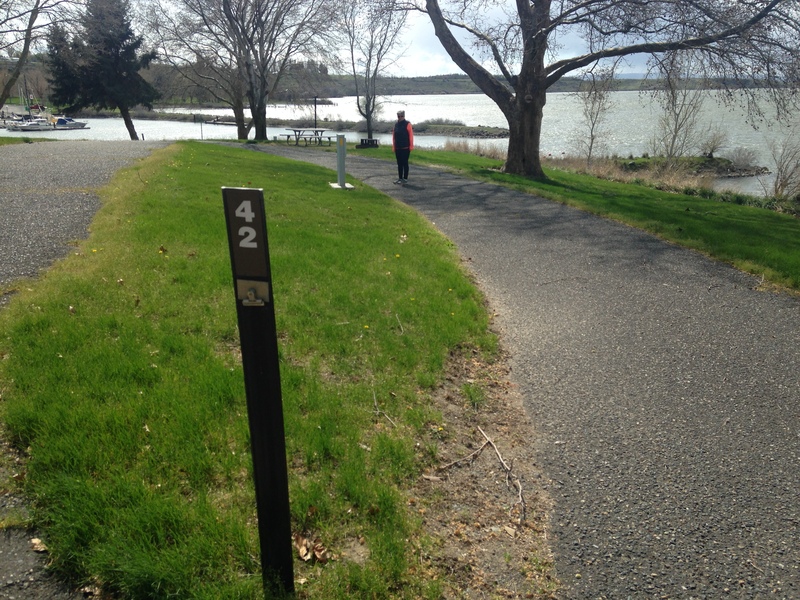 But…not wanting to risk anything, we decided to follow this Timber Road. As soon as we turned off we thought OMG we’re in for some excitement and sure enough, narrow, barely 2 lanes, and hairpin curves like you’ve never seen. Our saving grace was that no one else was stupid enough to drive this road so we could take up the whole road! Besides, it was only for 10 miles. No shoulder, drop-offs on the passenger side (of course). But….my Michael was at the wheel and handled it all like a pro. After that hair-raising detour, we made it back onto US 26. 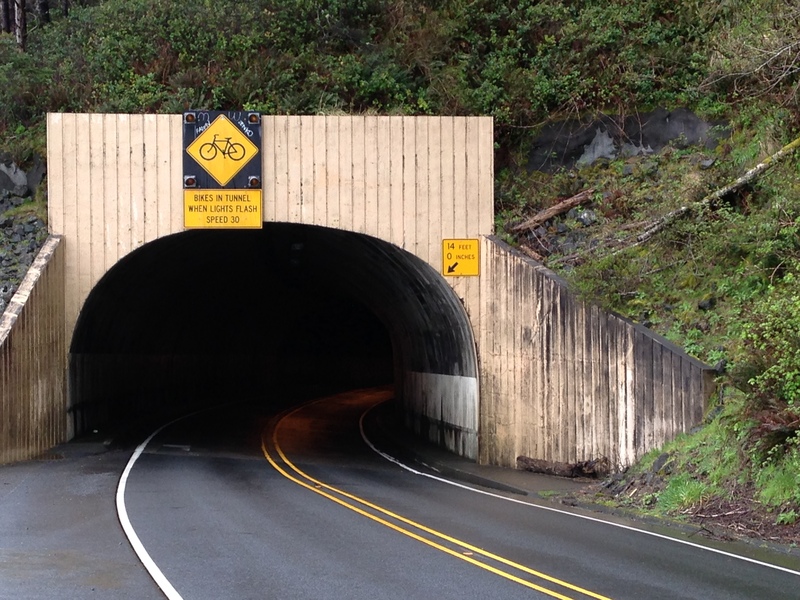 But….soon enough, (there being another tunnel between Seaside and Manzanita on US 101), our trusty GPS took us off US 26 onto OR 53. This time, much the same kind of road but rougher, the hairpins not quite as tight, and double the distance at 22 miles. 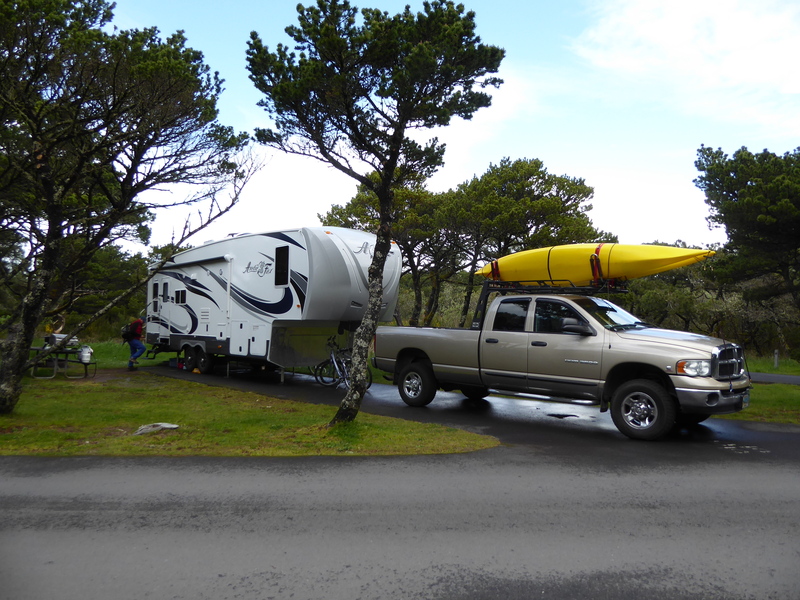 When we finally got here to Nehalem Bay State Park, the camp host was astonished at what we’d done. He said, “Hell, I wouldn’t drive that road unloaded, let alone fully loaded!”. That made us feel pretty proud. We had reserved ahead of time. There are two loops here: A,B,C loop for reserved campers, and D,E,F loop for first come first served. They all have water and 30 or 50 amp electrical service. We couldn’t fit into the one they’d reserved for us because there was no maneuvering room. We went for help to the camp hosts who lived up to their name. They helped us find the perfect spot in D loop. Michael backed it in first try and we got the trailer unhooked. Starting our arrival procedure, after leveling the rig, we went to plug in and….???? Not a fifty amp service – only a 30 amp. Our plug was only for a 50 amp. plug. The reserved spot had had a 50 amp. Oh well! Again the camp host helped….sent us off to Fred Meyer in Tillamook, a 20 mile drive. He even called ahead to make sure they had one and had them hold it for us. Off we went, oooohing and aaaaahing at the splendid views of the ocean and dreaming of a fresh crab dinner. Got to Fred Meyers and sure enough, they had it, we bought it, and set off back to camp. By this time we were starving, it being almost 8pm. We stopped at a restaurant perched oceanside called ‘The Pirate’s Cove.’ They were still open so, postponing the crab for a later date, we shared some fish and chips. Came home…..Mike plugged us in….let there be light! There was! Stepping into the trailer, Mike on my heels (to help move one of the recliners so we could put the living room slide out) mayhem greeted us. I had packed our printer in one of the upper cupboards, not even really thinking about it. When preparing for travel, I had considered putting some kind of binding/elastic around the knobs, just in case, but for some reason didn’t. With all the jostling of the rough roads and hairpins, the cupboard had opened, the printer had fallen out and landed on one of the dining room chairs (they lay on their sides when traveling) smashing it. (Mike thinks he can fix it!) There were also bowls all over the floor….not broken….thumbs up for Corelle!! That cupboard had opened as well. We moved the slide out and went to do the bedroom slide. When I opened the clothes closet, all of our clothes had fallen in a neat, organized pile on the floor. 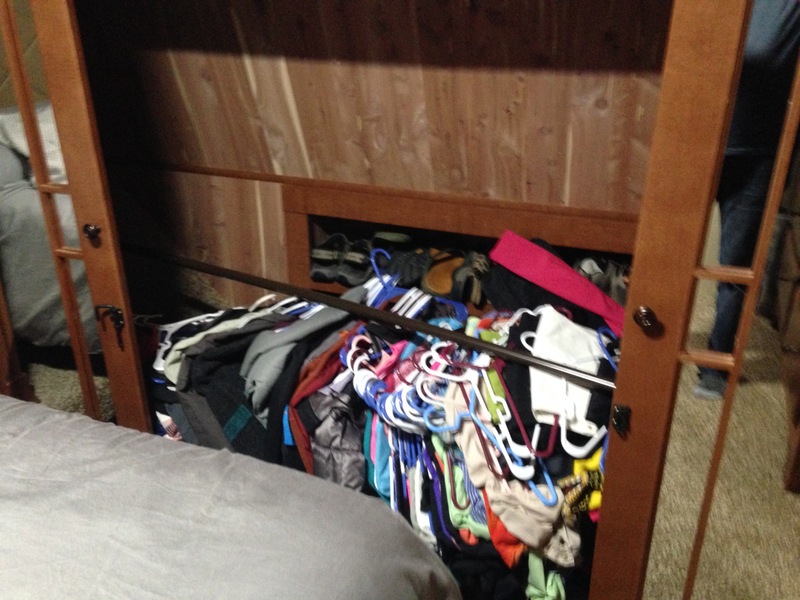 The rod holding the clothes had come loose from its attachments and had collapsed onto the floor!!!!! Arriving in Pasco at noon, we headed straight for the dealership full of anticipation. We couldn’t wait to see our new Arctic Fox (AF) fifth wheel. By the time we’d completed all the paperwork, it was late afternoon and we gratefully retired to our hotel room. Next morning we were up bright and early, knowing we had a lot of tasks to complete: we had a ‘walk-through’ scheduled which took over an hour; we had to transfer all our “STUFF” from the U Haul; we had to return the U Haul; we had to find a solution to attaching the bikes safely and conveniently to the trailer during travel; we had to load everything safely inside and outside the trailer; we had to hitch it up to an unfamiliar Reese hitch; we had to get ourselves and our new home safely to Franklin County RV Park. It was late afternoon and time for Happy Hour before we were finally driving the 2 miles down the road to the park. Plus, we were full of anticipation too, to see dear snowbird friends who were making their way North from Mesa. Coincidentally (or not), they were passing through at just the right time and had arranged to meet us. As we drove into the park, they were there to greet us….and so the celebration and inauguration of our new home began….an auspicious beginning. The days truly passed in a DAZE. We stayed much longer than we had planned, not realizing how many things had to be accomplished: shopping for groceries; finding and organizing our “STUFF”; phone calls and e mails to family and friends; looking for equipment (like bike racks); doing taxes; obtaining trailer insurance; learning how to operate all of our new equipment (a Reese hitch, trailer brakes and controller, airbag suspension, convection microwave?? ?, electric fireplace, built-in vac, heated seats, smart tv… to name just a few…); figuring out the height of our rig; developing arrival and departure checklists; setting up and learning how to use the new GPS specifically designed for RV’s….just a few of the many things we accomplished. Although we were busy with our “must do” list, we also enjoyed relaxing pastimes such as: waking up to the sound of the rain hitting the roof, feeling snoozy, and NOT feeling the need to do anything, knowing we had all the time in the world; we journaled, walked, biked, talked and then repeated those some more; I started playing my guitar again. 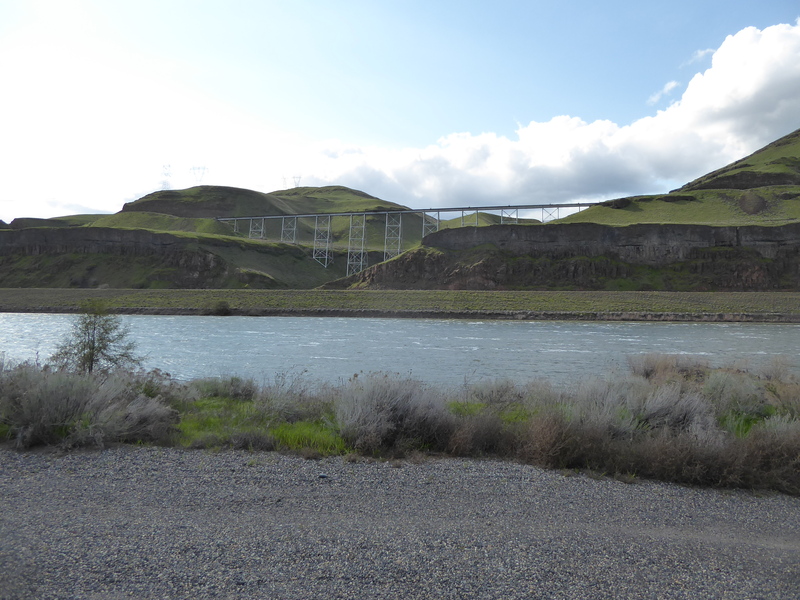 We explored the Snake River Army Corps of Engineers (ACE) sites all the way to the Lower Monumental Dam. Above the Lower Monumental Dam. Spectacular train trestle on the west side of the Snake, below the dam. 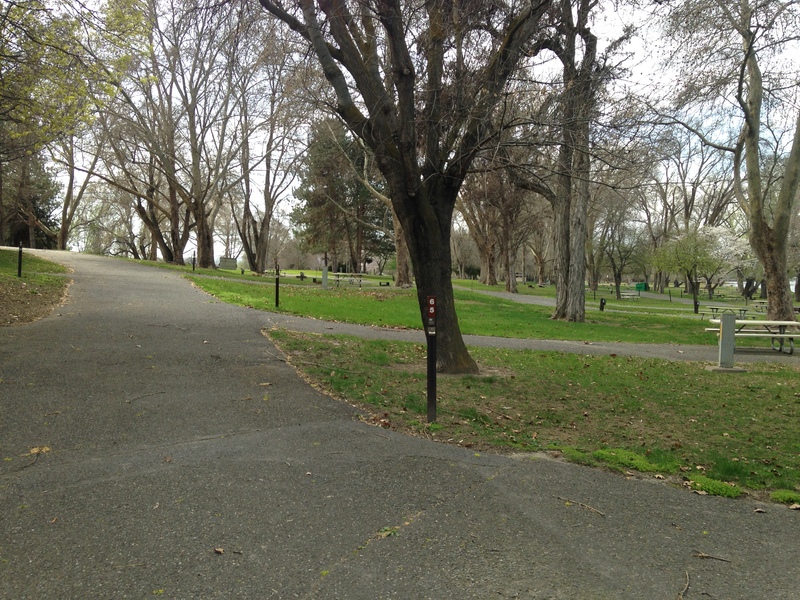 The first site was Hood Park just on the other side of the river from Pasco. Beautiful! 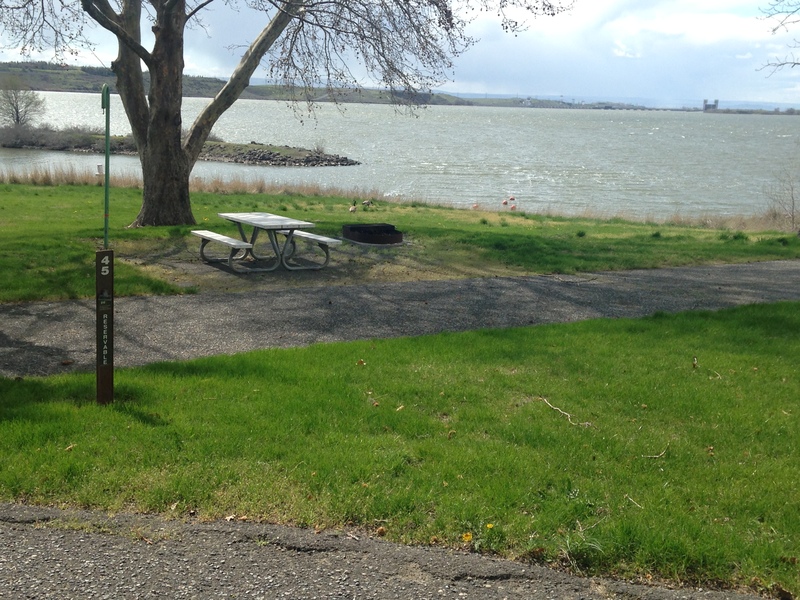 At the boat launch there we found a more detailed map of the ACE campsites and decided to explore further. 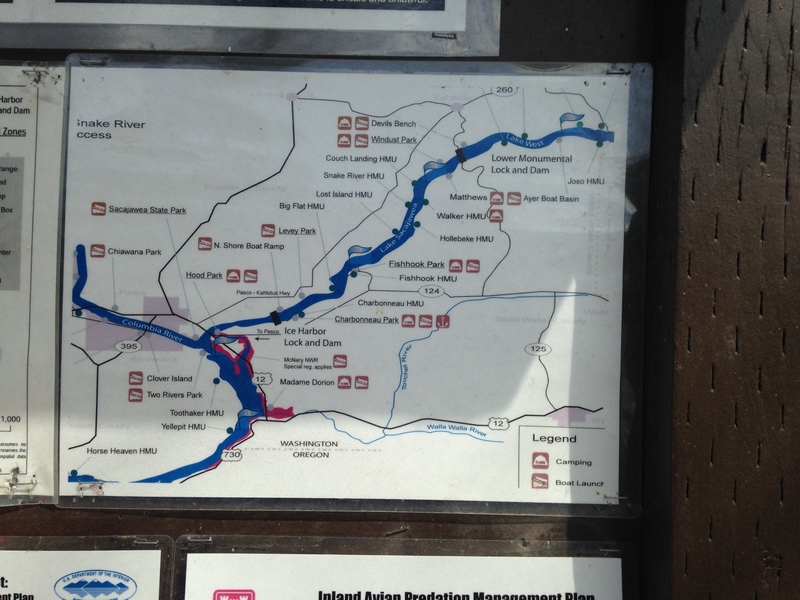 Detailed map we found at the Hood River Park. The next site was Charbonneau, even better than Hood with houseboats and sailboats moored. 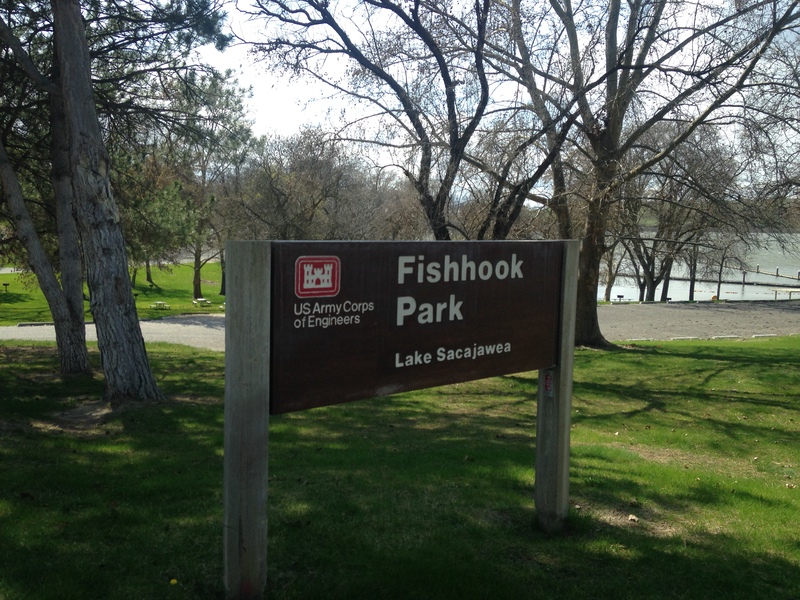 The last stop was Fishook Campground…the best but with warnings of nitrates in the water. Not too surprising since this campground is located right on the river, below acres and acres of apple orchards which had warnings about pesticides so maybe not the best place to camp. 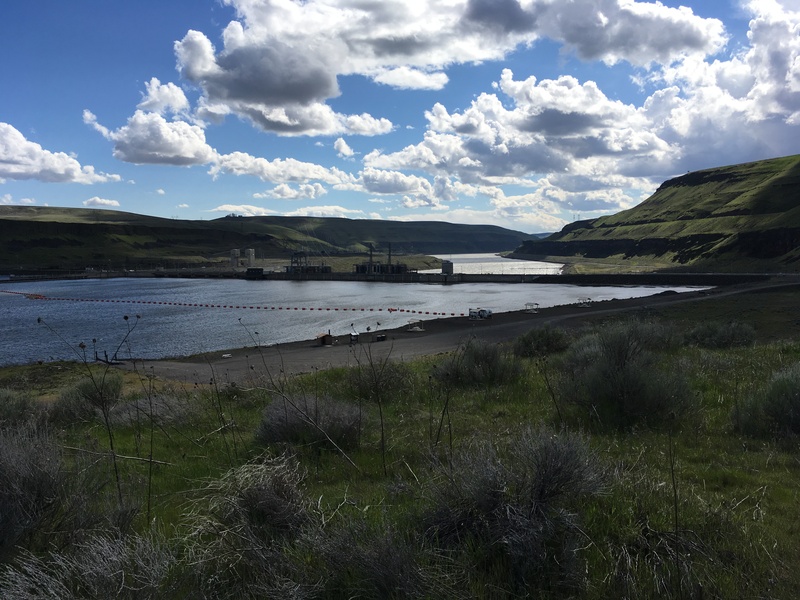 Enjoying the sun during a rest stop on a cycle trip along the Columbia. 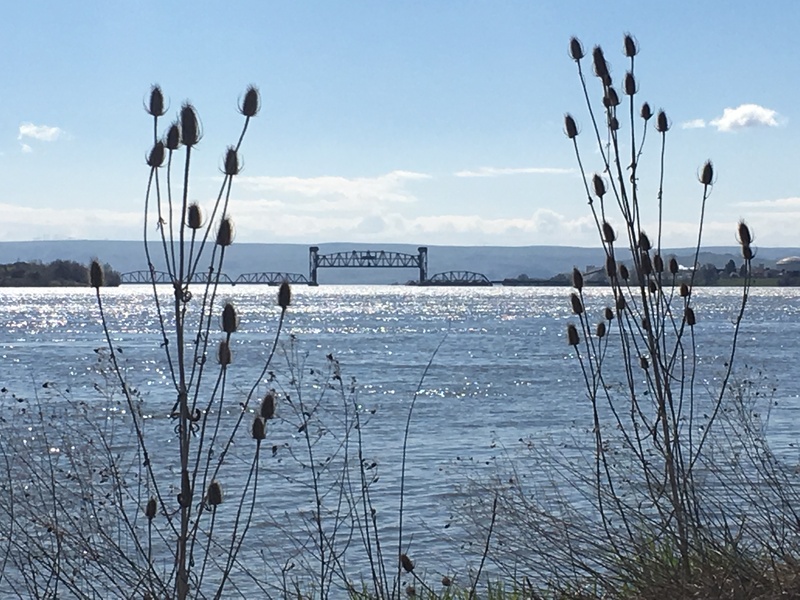 We discovered Bateman Island and spent a whole afternoon exploring that protected wetlands preserve sticking out into the Columbia River; we found a most unique little art gallery and discovered the illustrator ‘Steve O’Shea’ an amazing graphic artist!! 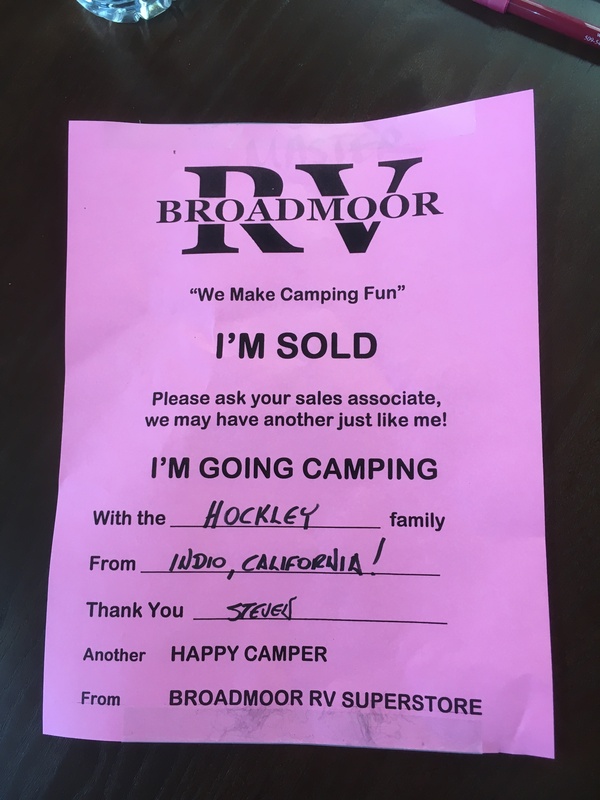 On one of our many stops at the Broadmoor RV Dealership, we learned that Northwood Manufacturing, the company that makes the Arctic Fox, is less than 100 miles away in La Grande, OR and that they regularly do tours. We went, we saw, we loved….loved seeing the bare bones of our fifth wheel and how it was put together. Gave us a lot of confidence in our rig. 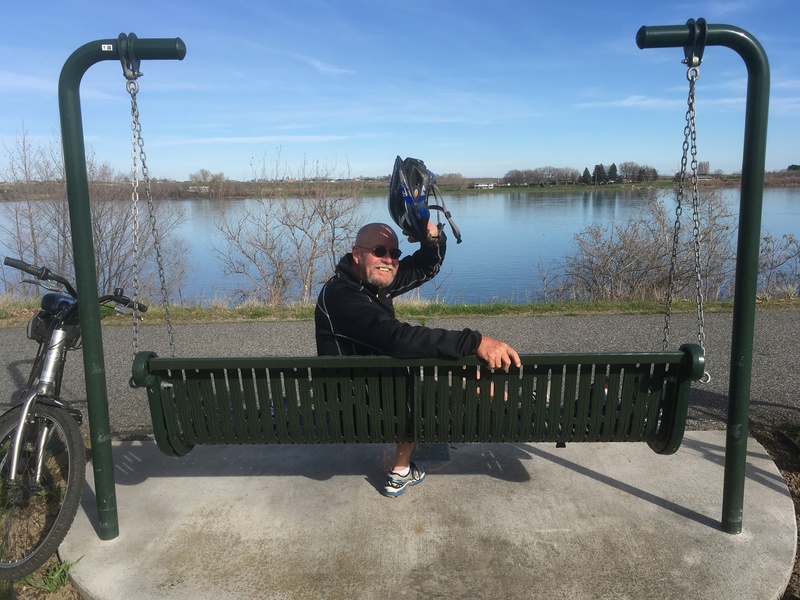 After three weeks in Pasco, I found myself becoming quite attached….so much to do and I liked this RV Park….great internet, quiet, and friendly. 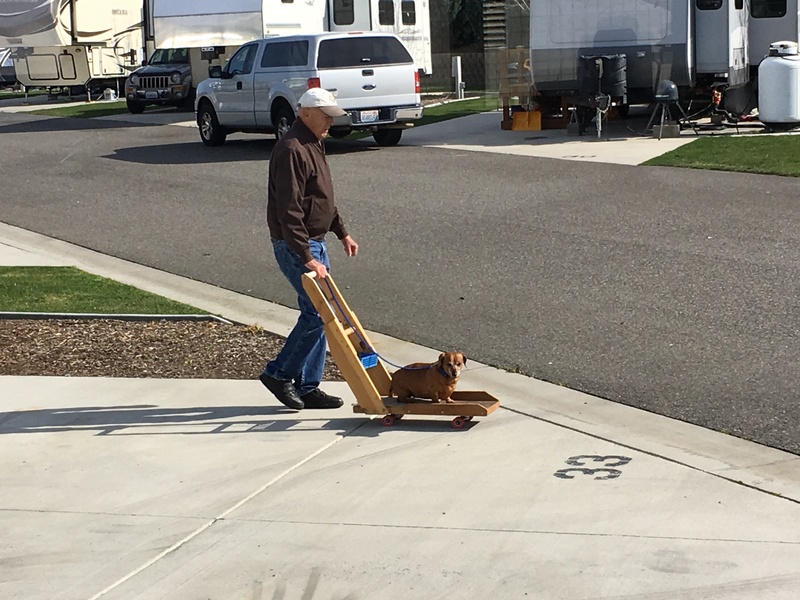 Our neighbor’s dog had had surgery but still got out on a daily basis for fresh air!! But, with the arrival of our trailer license plate, it became time for our maiden voyage to the Oregon Coast. 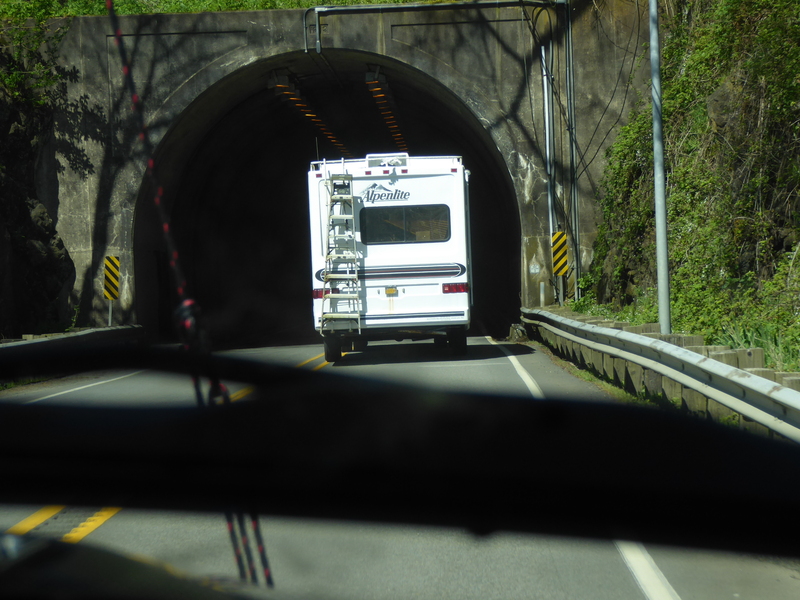 Feeling excited and ready to travel, I was also I was a bit worried….well….actually more than a bit, by the tunnels along HWY 101 of WA and the Oregon Coast….. Note the sign on the far top right-hand side…that’s where the lowest height is at 14 feet. Following behind a trailer as tall as ours, my fears were allayed somewhat by seeing this in a WA tunnel. March 24th was our last day at Travolta Ave in Indian Palms country Club. As we were madly doing our last pack, Mike at the truck loading the kayaks, bikes, and U Haul trailer; me in the house washing the mattress cover, duvet cover, pillowcases and clothes, awaiting the arrival of J&D Movers who were supposed to arrive at 9am but didn’t come until 10, our realtor called at 10:58 to tell us that the house had closed. It was no longer ours. Shortly thereafter, we departed, all our worldly possessions in, on, and behind our truck. Finally! After much anticipation, we were on I 10 headed north. We stayed on I 10 until we turned off on I 215 at Redlands, next onto I 15, CA 58 at Barstow and finally, at Kramer Junction, onto US 395 to Bishop. 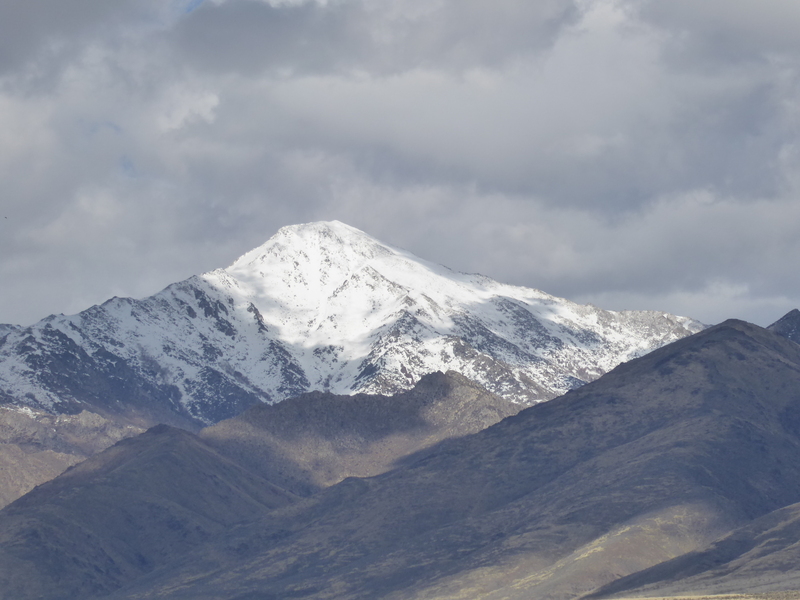 Spectacular drive along the foot of the Sierra Nevadas, a first for us. 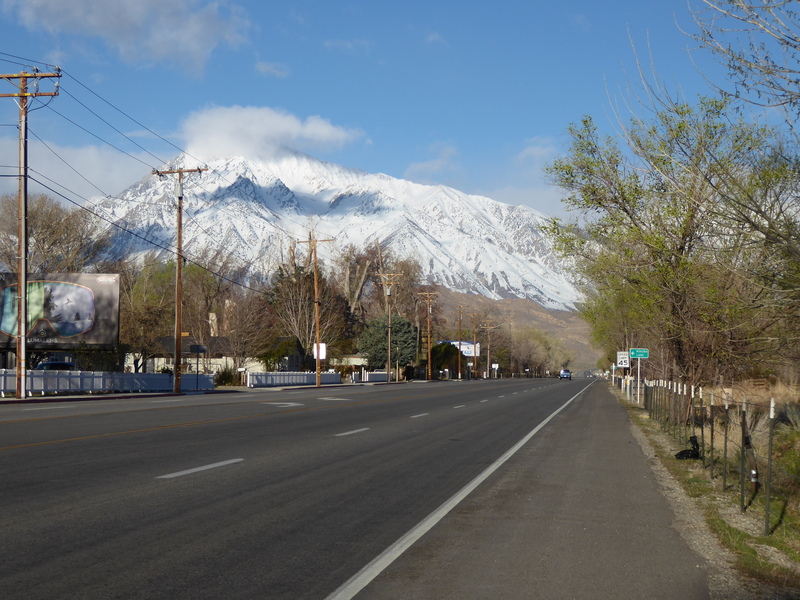 Towering into the clouds, covered with snow, we were driving in temps of 74 degrees F.
After checking in at the Red Roof Inn in Bishop, CA we asked about a local pub for dinner – they recommended the Mountain Rambler – a local brewery which was “hopping” with families, friends, skiers, and climbers – a superb recommendation. We found a spot at a table shared by two women and ordered a salad and some Thai meatballs. Delish! We loved Bishop and hope to go back and explore some day. 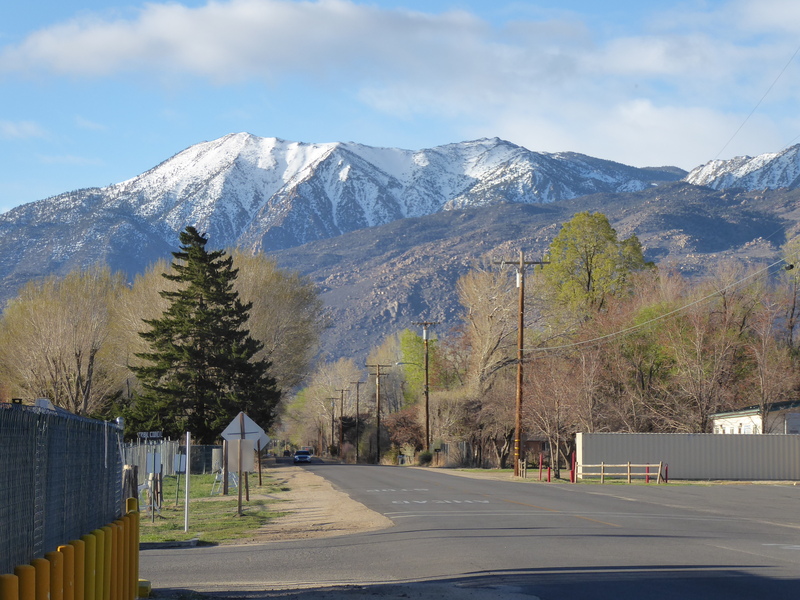 Next morning, after fortifying ourselves with good strong coffees from the popular ‘Looney Bean’ in downtown Bishop, we set off. Tooling along, enjoying the scenery and listening to Harry Chapin, I felt the giant hand clenched around my solar plexus loosen just a bit. Strange, because I hadn’t been aware it was there but now, in retrospect, not all that surprising I guess. Turned off the 395 to Tonopah and headed on US 360 to Hawthorne. Not a single other vehicle in sight. 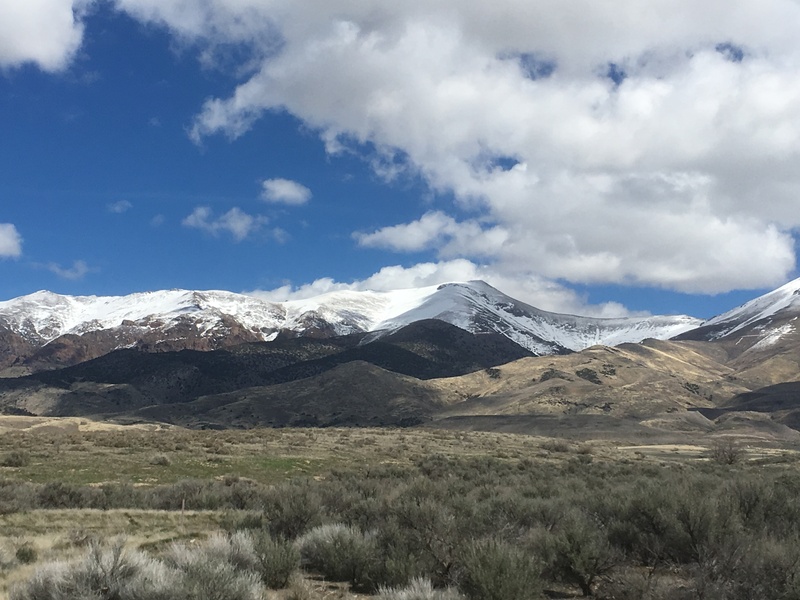 Discovery: This is what we need to be doing every day….exploring new places, new vistas….just passed Marietta Wild Burro Range – must check that out on a return visit. On US95, I mistakenly saw a “legal brothel! !” No mistake. Apparently, Mike informs me, brothels are legal in Nevada!!!??? 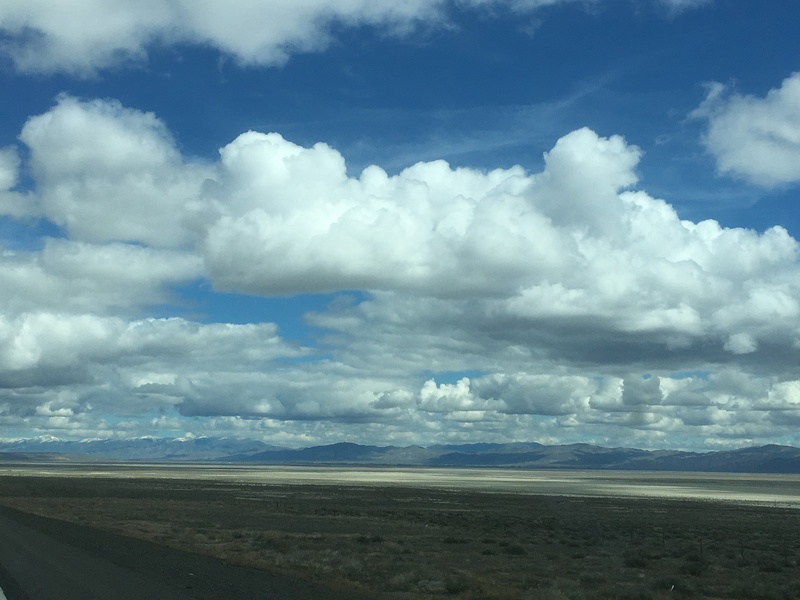 I 80 to Winnemucca and then went back onto US95 for a short distance through Idaho. 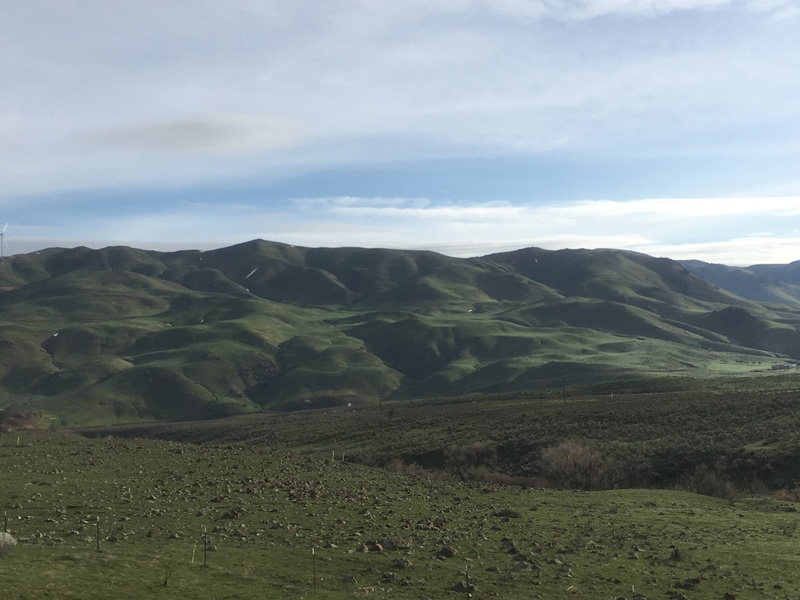 Thought we were going to stay somewhere in Jordan Valley but there were no motels – proceeded to Ontario OR for the night. The scenery has been spectacular. At first, in Oregon, we passed through miles of yellow grass valleys. Then it changed to sagebrush and finally to grass covered mountain/hills with outcroppings of basalt – spectacular. We stayed overnight at The Quality Inn in Ontario, Oregon. It was a good room – 2 queens and included breakfast for around $100 but I couldn’t sleep for the life of me. Too excited. What a spectacular trip from Ontario to Durkee….green, green and more green covered mountain-hills. We followed the I84 as it wound its way around and over the hills. Travelled for a short while beside the Snake River which has overflowed its banks – very reminiscent of Kamloops during a heavy runoff year. 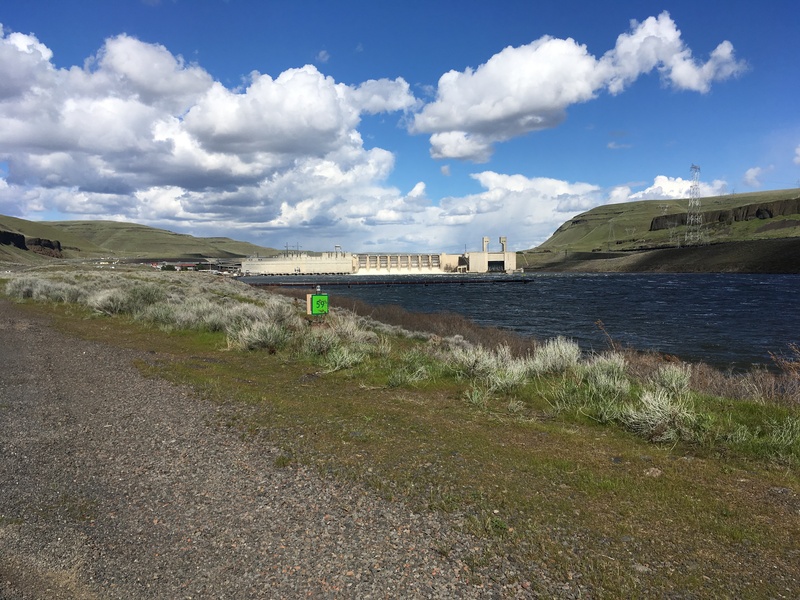 Stopped at a rest area just past Baker City, checked that the bikes and kayaks were tied down tightly and then continued on, arriving in Pasco at noon. I can’t even begin to describe these past two months, from the point at which we made the decision to go full-time RVing to now. During the first few days of the new year we found ourselves casting about for places to go. Before we knew it, we had decided we didn’t belong in a Country Club and needed to go traveling in our fifth wheel trailer. It was magical, how the decision seemed to make itself and how everything seemed to fall into place. It seemed like every time we turned around, there was a new affirmation that what we were doing was the right thing – from the house going on the market, to selling within a month, to getting rid of all of our stuff (selling, giving away and consigning), to re-establishing Wyoming as “HOME” and feeling so good about being “from Wyoming” again, to finding the truck and fifth wheel of our dreams ……we never looked back once. Was it stressful? Absolutely! Almost every day I would wake up at 1, 2 or 3 am, mulling over all that had to be done and not sleeping another wink until the next night. We even made it down to Al Godones, to Nava Dental for one last lovely visit (for me to get a crown). To top it all off, as we hummed on down the highway, we got a notification from USAA that the money had been deposited in out bank account….earlier than expected….! A cause for great celebrations. Thirteen years earlier, having accepted a teaching position in the Middle East, I had struggled with this same question. At that time, I decided to store everything in a dear friend’s basement for the year, unsure if I’d like the expat lifestyle. A year later, infatuated with my new lifestyle, I decided to get rid of most of my STUFF. What I learned in that process was that once you give something away, you rarely miss it. “Out of sight; out of mind” worked well for me. Fast forward to the first 3 months of 2017. It was more difficult this time. For 13 years of teaching and traveling, I had been on a mission to collect things from the places I’d visited: works of art, culture, and crafts, as well as items from nature: shells, rocks, sand, feathers, porcupine quills….! Needless to say, I now had more STUFF to get rid of. I could often be heard muttering to myself, “This has been sitting in a tub in the garage for the past 2 years. I haven’t looked at it once. Do I really need to keep this?” That realization helped me. What also helped me was connecting with a most special young woman through an online app called Nextdoor where I had posted some of the things I was trying to sell. With her, many of my spiritual, emotional, ’meaningful-to-me’ treasures found a home. I learned that it was more important to find a good home for my treasures than to get a good price for them. My solution to downsizing started with online research. 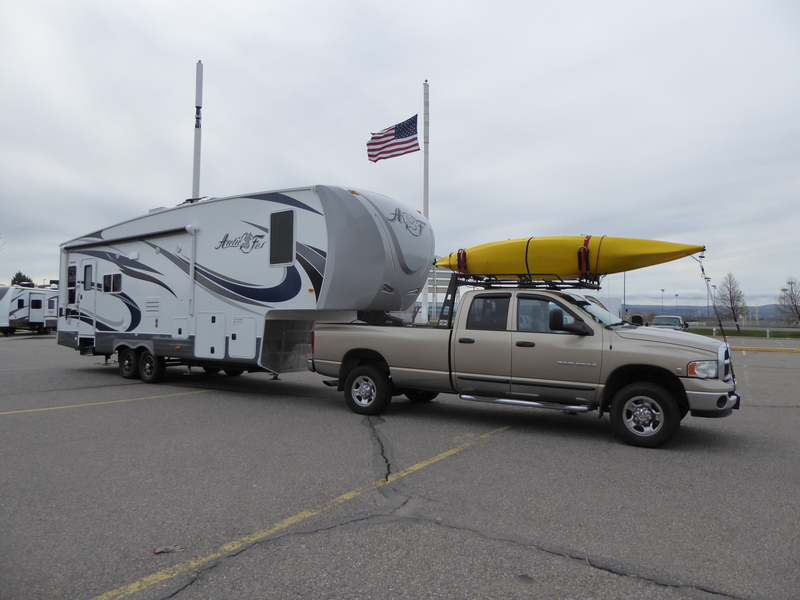 I had been following the blogs of several fulltime RVers. On “Wheelingit” I found lots of very helpful information about this topic – http://wheelingit.us/2016/01/26/selling-your-stuff-part-i-4-basic-selling-tips/ . I did a lot of research to see how I should price the “big stuff’. Our big stuff included a utility trailer, motorcycle and equipment, a car, furniture, and antiques handed down to me. Once priced and posted, the sales began. Was it easy? NO! Was it rewarding? YES! My priority was down-sizing and that is what I did. When things became tough, I remembered what my mission was. I started early. In retrospect, that was one of the most important things I did. It allowed me to gauge what people were willing to pay for my STUFF. It allowed me to talk to the people who did come and to listen to their suggestions about which charity to donate to, which consignment shop was trustworthy. It allowed me to come to terms emotionally, with the process. It not only made the process possible, it made it bearable and sometimes even enjoyable. In the beginning it seemed to be an insurmountable task; one that created many sleepless nights as I pondered what to do with this or with that treasure. Now, on the other side of the process, I am ecstatic. I have everything and more, that I need or want. YES – Adventure : Easier Said than DONE… but not too bad. Posted on 19 April, 2017 by Mikal | Comments Off on YES – Adventure : Easier Said than DONE… but not too bad. It is easy to say “let’s chuck it all, sell everything and take to the open road”. Doing so adds more and sometimes more difficult decisions. The first hurdle to ‘chucking it all’ was selling our house. Our homeowner’s insurance website updated the value of our house monthly. So we had an idea how much to list for. Dianna (the Real Estate agent who sold us the house) had become a friend and still lived in the country club. We sought her out for advice. Houses were selling and our asking price was comparable. We listed (with Dianna of course) our home mid-January; had an acceptable offer by the 3rd week of February and closed 30 days later. It was faster and easier than we dared hope. Unknown to us when we listed, we would have less than 60 days to un-“STUFF” enough to move into an RV (a significantly smaller accommodation). Tilly took on the task of deciding ‘the what & how to get rid of part’ for our joint possessions. She brilliantly de-stuffed us (see “Out of Sight-Out of Mind”). A major factor in all our decisions was the type and size our RV would need to be. The number of available accommodations in RV parks and other campsites declines significantly with every added foot in length. Figuring the best balance between type and size was MY job. Our RVing experience was limited to a couple of summers plus a few weeks in both a VW Westfalia and our existing Ford F150 & 24’ 5th wheel combination. 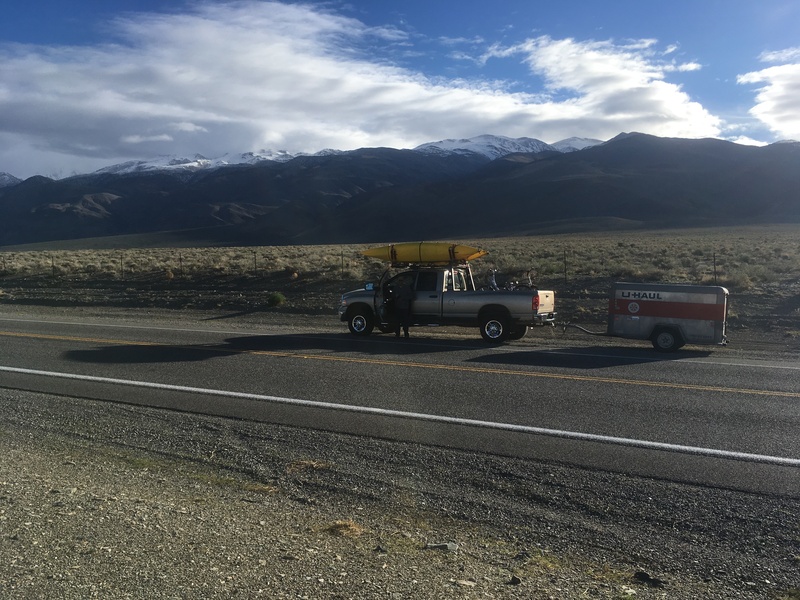 We had already worked out the kinks of hauling our kayaks (on a custom designed & built for 5th wheels rack for the truck built by U.S. Rack – https://www.usrack.com/responsive/fifth-wheel-truck-rack.php . 1 – The trailer, while comfortable enough for a long holiday, was not large enough to accommodate full time living – the bathroom as small as any airliner’s toilet and the shower stall seemed made for a anorexic midget. The couch and dinette were so close that whenever one of us wanted to move it was an exercise in contortion. 2 – Our truck while having a large engine, was not otherwise up to towing a larger/heavier 5W. It was already was at the upper end its towing capability. No matter what, for full-time RV living we would have to sell or trade in our truck and trailer and buy a larger RV with more storage. The choices for RV living are widespread … ranging from Class A – bus type motor homes, Class B – camper type vans, Class C – a cross between the camper type van and bus type, cabover campers on pickup trucks, bumper pull travel trailers to 5th wheel travel trailers. We decided to visit local RV dealerships to help clarify which type(s) would meet our desires and needs. Visiting an RV dealership is almost a survival of the fittest scenario. It feels almost like smearing your body with chum and diving into the ocean. You are set upon by a trio (the salesman, his buddy and usually the general manger) of desperately hungry sharks – one nudges and bumps while the other two circle keeping you off guard, to wear you out enough for the kill (SALE contracts)… while the lesser sharks (other salespeople) circle out of range just in case. Our “24 HOUR RULE” saved us more than once as we were driven to the verge of desperation into potentially buying something we were not sure we wanted. Back and forth we went for weeks … Class A? 5W (5th Wheel travel trailer)? Class B was too small for living full time. But each of the other categories had both positive and negative considerations. 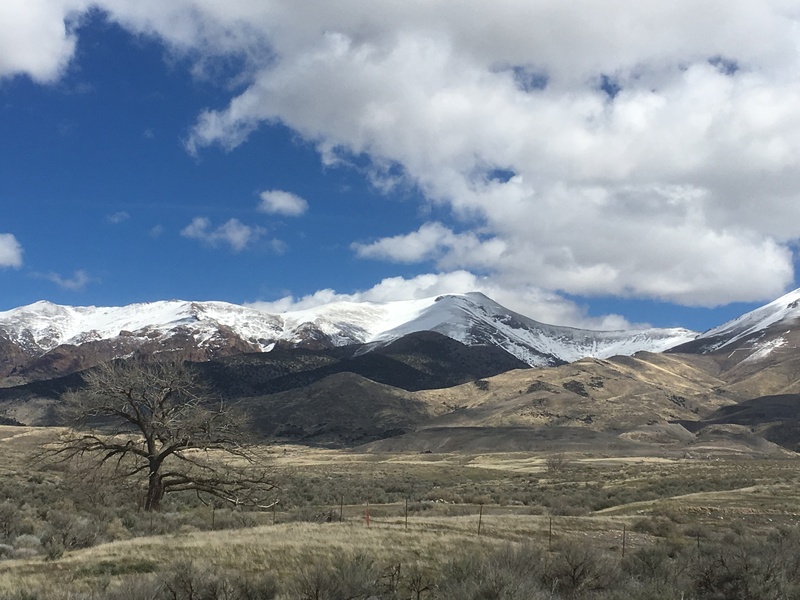 Choosing the best RV for us was going to be based on our ideas about which type would most meet what we needed (space for living full time) & wanted ( freedom and flexibility to travel out of the way places i.e.- the boonies). Our decision was helped by a couple of emails from our friends J and N (perennial snow birders & boon dockers). We had told them of our idea/decision to go full time and our dilemma of which type of RV. They shared details of their search to upgrade their existing rig (cabover and diesel truck) to a 27′ 5W trailer. J has a wealth of experience and knowledge about RV’s and boon docking. So any decision or recommendation he makes is well worth consideration. We were already experienced with living in a 5W. If we replaced the truck, our current 5W would suffice until we could find a 27′ or slightly larger 5W. It made the most sense to follow that course. So began the search for a new truck. Last year while towing our 5W down from BC to California via Wyoming and Utah, I had watched enviously as diesel trucks (pulling bigger 5Ws than ours) chugged past while we crawled up hills. I knew zip about diesels… J again came to my rescue. Based on his advice supplemented by my own research of towing and diesel truck forums, I began the search for a Dodge Ram 2500 (judged to be the one of the top choices for towing 5W trailers). In the 2003-2005 models, Cummins diesel engines are STILL considered to be some of the best. All I had to do was to find that make, model, and year, in good shape and with low mileage AND then a larger 5W trailer. How hard could that be? Comments Off on YES – Adventure : Easier Said than DONE… but not too bad. The Decision – No to Normal, Yes to Adventure! Posted on 10 April, 2017 by Mikal | Comments Off on The Decision – No to Normal, Yes to Adventure! Our home in Indio CA. 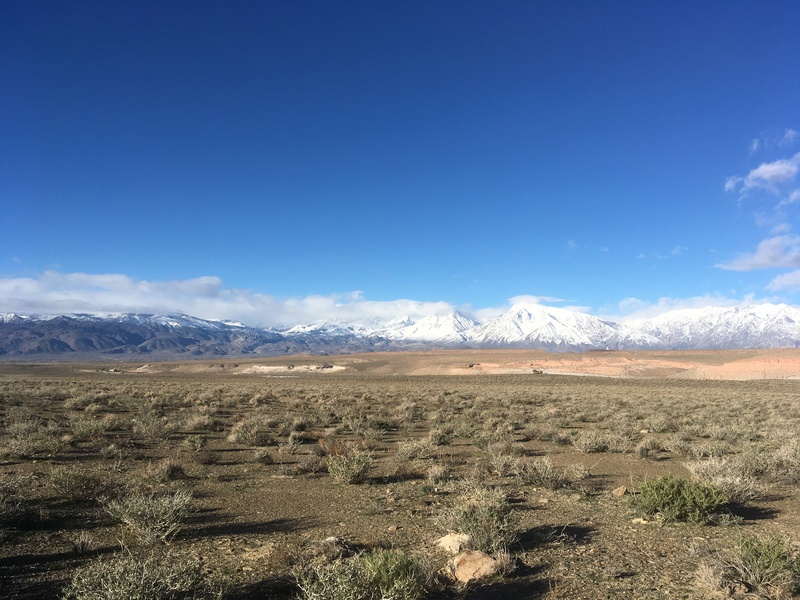 Located 3km from the San Andreas fault… we lived with frequent tremors and an awareness that a devastating earthquake could occur at any time. One that would permanently change the landscape and our lives. 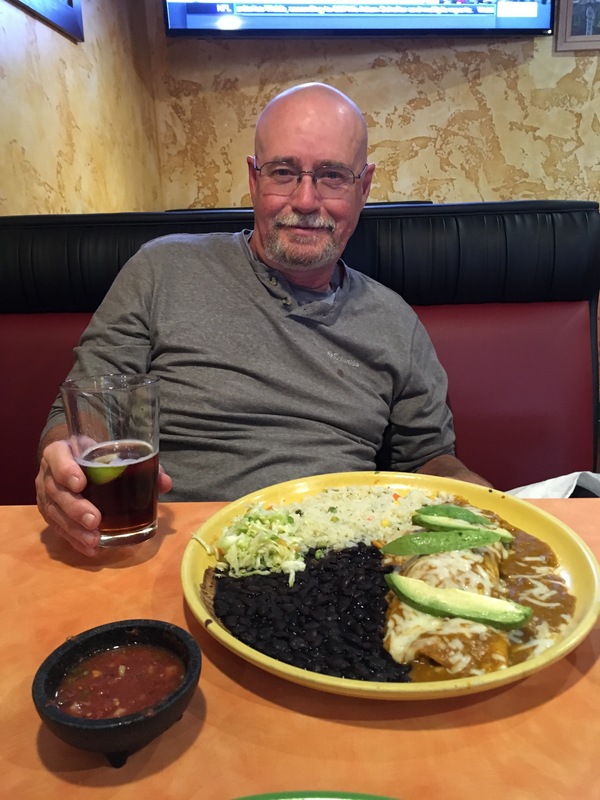 Life in Indio was losing its excitement as we settled into the ‘normal’ lives of homeowners. We took on the ‘normal’ tasks of housekeeping and maintenance. Tilly decorated, then cleaned the house. I fixed things, then built a patio extension with a cover. Always something needed fixing or improving. So busy being ‘normal – we missed the small tremors. Earthquake! – a perfect description. Small tremors in our lives were there, some felt – most not, since the day we retired to Southern California. And then, the BIG ONE happened on New Year’s Day 2017. It began with sitting in front of our cozy fireplace sipping coffee with the question … “Are we happy?”. In 2010, we made an offer to buy a canal boat. We were a few years from retirement and not ready to return to NA. Dreams of cruising and exploring the canals of Europe fueled our sense of adventure. The canal boat deal fell through but, I still daydream about cruising the canals of Europe on occasion. We were/are always happiest when planning for and going on the next grand adventure! We felt that way last fall with our 5W in tow. We traveled the long way home from BC to California. We hiked the mountains of Wyoming and the deserts of Utah – kayaked mountain lakes and the Colorado River – a leisurely exploration. Who spoke first? No matter, because it was an easy decision. .. Adventure First! Next: Preparations and More Decisions. Comments Off on The Decision – No to Normal, Yes to Adventure!